MIAMI (Jan. 28, 2019) – Costa Rica’s Minister of Public Security Michael Soto Rojas visited the headquarters of U.S. Southern Command and met with SOUTHCOM commander, Navy Adm. Craig Faller, Jan. 28. 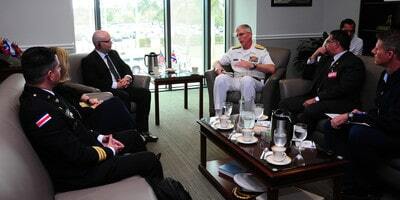 Rojas was at SOUTHCOM to meet with Faller and command leadership to discuss regional security and cooperation. The visit was Rojas’ first to the command. Costa Rica’s security partnership with the United States includes cooperation in countering illicit trafficking and training engagements.